My children have STILL not decided what to be for Halloween this year. It’s just about killing me especially since I spent the weekend making my niece’s Ben 10 costume. I know my own are going to come at me the night before expecting some elaborate costume. Do you set a deadline for your kid’s to choose? I have a thing for family themed costumes, so after the middle boy changed his costume request, for the third time, to copy his big brother’s policeman costume, I knew just what the 2 year old would be. Cause he’s two. And doesn’t know yet to argue about what to wear. So the littlest tyke (poor thing) is the jailbird. Which is actually perfect for him. But don’t tell him I told you so. I couldn’t find black and white knit fabric with stripes wide enough for a true jailbird so I decided to make my own. 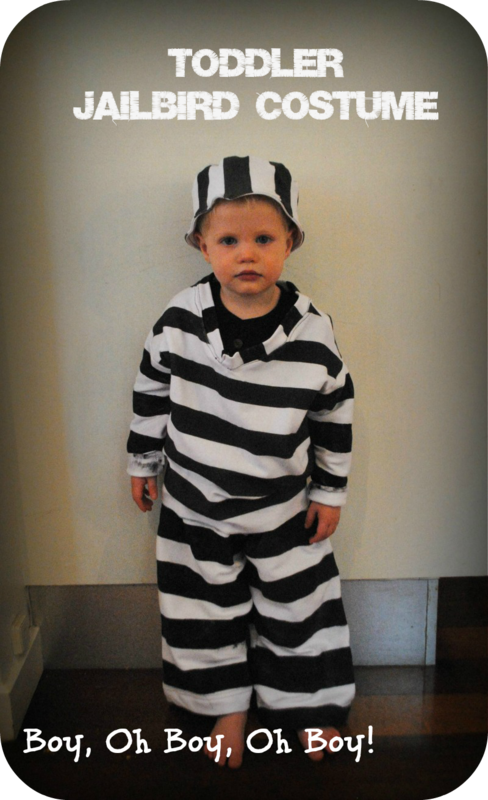 Here’s the down-low if you want to make your own jailbird knit costume. Step 1: Cut out your pattern pieces ( For the pants I used the Kickin’ Back Sweats and for the shirt I modified the Pauley’s Pullover both from “Sewing For Boys“). The Jailbird Hat pattern and tutorial can be found on my blog. Step 2: Place a piece of painter’s tape every 1 1/2 inches until each pattern pieces is covered in stripes. If you decide to use a store bought sweatsuit, you’ll need to make sure you wrap your tape from front to back in a continuous circle. 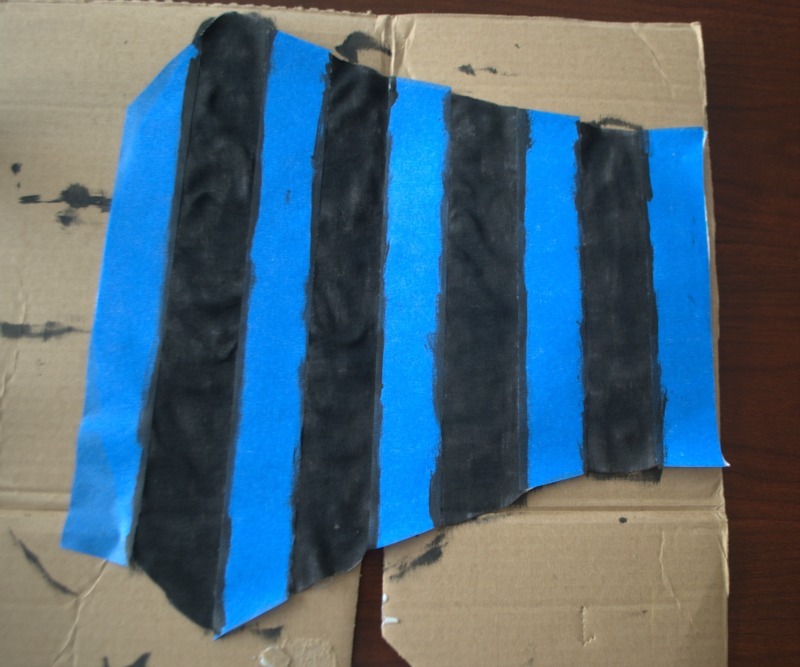 Step 3: Use black fabric spray paint to cover the white areas of the fabric. Let dry for at least 2 hours before removing the tape. If you can’t find fabric spray paint in your local store, you can always use an acrylic-textile medium-water mix (about 1 part paint and 1 part textile medium to 4 parts water). Regular spray paint would work as well but it tends to leave the fabric with a crunchy, stiff feeling even after washing. 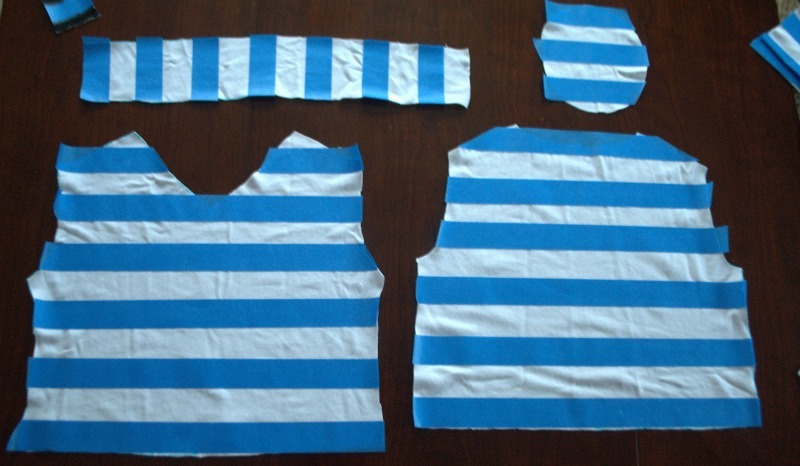 Step 4: Sew the pattern pieces together per pattern instructions being careful to match up your stripes. Step 5 (optional): Use a number stencil or draw a long number with black sharpie marker on a piece of fabric or twill tape. Then machine applique the number across the front of the jailbird shirt. By the time Halloween rolls around where we live, it is pretty darn cold so I went with a 2-3T pattern size even though it is clearly too large for him. I did this intentionally so we can squeeze a few thermal, fleecy type layers underneath . I’ve worked with the patterns in “Sewing For Boys” many times now and find they generally run big for my kids. No matter which pattern you choose to use, keep the pattern measurements in mind and be sure to modify for your own little jailbird. I’m off to make sure this sneaky criminal hasn’t stolen the cookies out of the cookie jar.